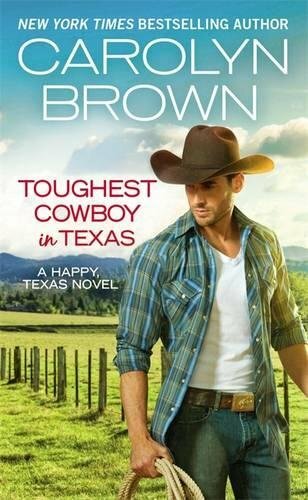 Toughest Cowboy in Texas is the start of a new series for Carolyn Brown, and it’s a wonderful start, full of the tough, tender cowboys she favors for heroes. Brown uses references to several country songs in this novel, and I have a feeling My Heroes Have Always Been Cowboys is the song motto of her writing. The hero and heroine have known each other before, as kids in the hometown of Happy, Texas. Lila is the wild child known for her wild reputation; and Brody is one of the town’s favored golden sons. When you’re seventeen, you’re not exactly known for doing the right thing, especially when it comes to love, and Brody is no exception. Brody stood up Lila for the only real date he ever asked her (even though he had no problem sneaking around with her and going skinny dipping), and Lila had to leave town the next day with her mother before he could make things right. Lila hasn’t been back to Happy, Texas since, but upon her arrival, she feels just the same. As the song goes, you’re always seventeen in your hometown. And when Brody walks through the doors of the diner where Lila is working, all the feelings she felt for him are just as vivid and tumultuous as they were then. She’s home only long enough to sell the diner her mother owns, a summer prospect only, and she does not have time for a cowboy who is only interested in her for the moment. Brody doesn’t have time for a relationship. He’s been working the ranch since his father and grandpa died about a year after Lila left. But seeing Lila again brings back all the feelings he had for her then, and he is determined to make things right. Lila is clear she has no plans to stay once the diner is sold; she has made a life for herself far from Happy, Texas, one where she is respected, admired, and respectable. The small town has already made it clear they’re not interested in any new reputation Lila now has. Small towns have long memories about what category people belong in. Brody works to win Lila over, feeling free for the first time in years in the company of Lila, who is still a wild child, his wild child. Getting her to stay with him will take everything he's got, but he’s determined to do it right, first by dating her in public and also bringing her to his family in intent to make her part of his family. While I myself haven’t been to church in years, I was impressed by the scenes where church attendance was used to build Brody and Lila’s relationship and cement their attachment. Also, the scene where he sneaks out of her bedroom in the middle of the night to avoid being caught by Lila’s mother--priceless. Did I mention there were kittens in this book? Yes, there are, and they’re adorable. Full of Brown’s sweet and steady secondary characters, swoon-worthy heroes, and heroines who are easy to identify with, the new Happy, Texas series is bound to be the best Carolyn Brown series yet. I grew up in a small town, and while I love series that are set in small towns, some of the saccharine “we’re always here for each other” small town fiction gets a little old. I prefer the characters who would rather be dragged to death by wild horses than go back to their small hometown and come face to face with the same small-town mentality you’ve spent thousands in therapy trying to get over. Lila was a favorite of mine; and I loved how hard Brody worked to make up for the hurts he caused her. I see the hints for possible other books in the future, featuring secondary characters who won my heart as much as Lila and Brody did. I enjoy her stories and her sense of humor too! I can relate to Lila. Small towns have their advantages, but they do have long memories which are not always kind. Thank you for the review.